Landlords will not have faced eviction at the rate at which professional eviction service providers do. Since they have dealt with many cases over time, these professional landlord eviction service providers are experienced and thoroughly understand the eviction process. They will be able to understand your case and help you accordingly. Eviction can you a great deal of stress and effort which a professional eviction service can take off your mind. 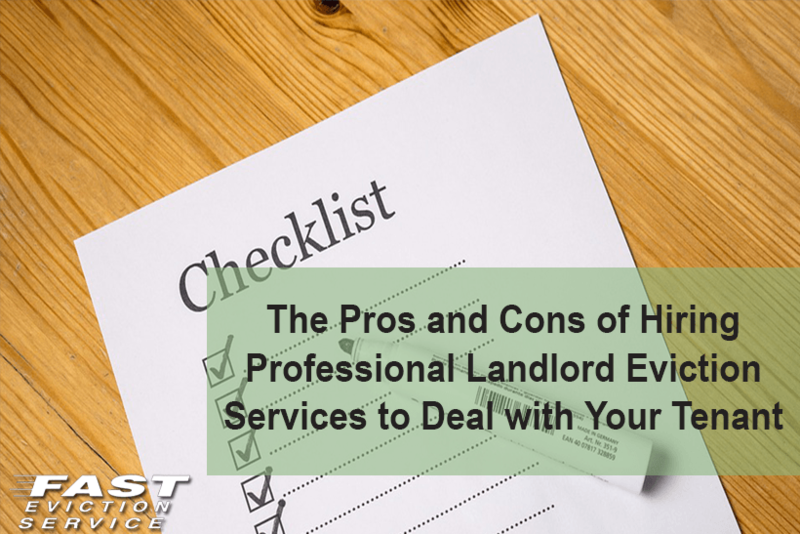 The process involves lengthy and very detailed paperwork, which may become stressful and tiring for most landlords to deal with. Many states such as California have customized eviction rules and laws which need to be followed in order to evict your tenant legally and fast – and the tenant has legal rights too. In order to follow the process systematically and correctly and avoid any trouble with the court, professional eviction services will help you deal with it in an efficient and compliant manner. As a landlord you may be busy with work and other responsibilities and not have the time to deal with an eviction process. Eviction services provide you with the convenience and ease of dealing with an eviction, which you otherwise may have been delaying. The more you delay the eviction process, the more it will become difficult and stressful for you to deal with later on. Tenant eviction involves many legal details. For instance, you first have to give a notice and time for the tenant to rectify the situation. If they do not, then a case has to be filed in court with an eviction notice and request a hearing. If as a landlord you miss out on any details, the judge may rule the case in favor of the tenant and you sure do not want that. To stay on top of every legal detail and not miss anything, professional tenant eviction services are there to help. Tenant eviction services may charge you fees that might be too much for you to pay or might seem outrageous to you. However, due to the many options available to you and considering how much the eviction services help you to get rid of the unwanted stress of a troublesome tenant; you may consider negotiating the fee. Since it is for one time and their services are professional, the fee may not seem as much considering they help you deal with your troublesome tenant. It may feel to you that an eviction service company is taking too much time to close your case and deliver results, due to the large number of cases they may be working on. As a landlord, you must want the process to be completed as soon as possible. However, remember that for a legal eviction to take place – sanctioned by a court order and enforceable by a police officer – a proper formalized process needs to be followed. The processing time may not always be in the hands of the eviction company. They do however deliver to the best of their abilities wherever possible. As a landlord who may pursue eviction on their own, professional landlord eviction service providers are a better option to save time, effort and to escape the trouble of dealing with the entire legal process.